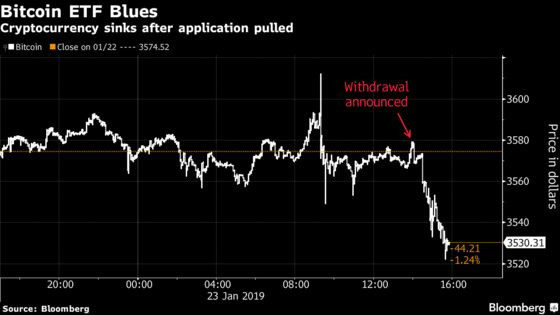 (Bloomberg) -- Cboe Global Markets Inc. pulled its application to list the first Bitcoin exchange-traded fund, blaming the U.S. government shutdown. The decision was announced in a Wednesday filing with the U.S. Securities and Exchange Commission. Bitcoin’s price fell following the disclosure. Most SEC employees are furloughed because of the partial closure of the federal government. That poses a problem for Cboe because the regulator’s deadline to decide on the application was fast approaching. “Cboe’s decision to withdraw its filing with the SEC to list and trade shares of the VanEck SolidX Bitcoin Trust is a function of timing related to the U.S. government shutdown as the end of the review period approaches,” Cboe said in an emailed statement. “We plan to resubmit a filing at a later date and look forward to continued discussions with the SEC.” If it does reapply, the clock for the SEC’s review will restart. Cboe’s application would have permitted a fund from VanEck Associates Corp. and SolidX Partners Inc. to list on the Cboe BZX Exchange. The SEC has indicated it’s not comfortable approving an ETF until it can be proven that the underlying spot market for Bitcoin is less susceptible to manipulation.